Columella says of this day, "The Dolphin begins to set: also the Lyre sets." On this day in 13 BCE, an altar to the Pax Augusta, the Altar of Peace, Ara Pacis, built on the Via Flamina, was consecrated by the Roman Senate. This event is commemorated with the Festival of Peace, held in honor of the Roman goddess Pax. Pax and Irene, both meaning “Peace,” became common names in the Roman world, and Pax was imprinted on coins. In 1948, Mahatma Gandhi was assassinated in New Delhi. On the second day after the new year, the Chinese honor the God of Wealth by setting off firecrackers all day long. 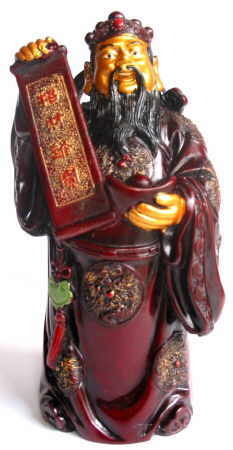 Tsai Shen Yeh was originally a follower of Confucius. But he felt there was no power in Confucianism, wanting to live a long and healthy life. One day he had a chance visit with Lao Tzu who invited him to learn about Taoism. He became a fervent student of Taoism and eventually he became a Taoist master. During this time he devised a system called Reifu which is a kind of spiritual caligraphy , a way to heal people and become enlightened. He became famous for being able to heal the sick. People came to visit him, and he healed their illness using a combination of calligraphy and psychic healing. Because he of this, Tsai became very popular and wealthy. By tradition, he discovered a potion that can also help people to become enlightened. There is a story about Tai Shen Yeh. One day Tsai visited a village where there was a problem with a well and this well was the only water in the area. But a bad spirit had infected the well and it became diseased with evil spirits. Tsai cast a calligraphy spell which turned into a golden crow and flew into the well, then suddenly a large evil spirit creature appeared, became fearful, and ran away. After he died many Chinesewere put up his image and used his calligraphy in their homes to avoid financial problems, and have a peaceful life. The people soon discovered that their wishes came true and more and more people started doing the same things following his teaching. Whoever display Tsai Shen Yeh in their homes, will be protected by him, especially wealth and healing. The Roman Emperor Didius Julianus was born at Milan this day in 133 AD. On this day in 282 BCE, Ptolemy II Philadelphus, the second Ptolemaic ruler of Egypt after Alexander, died. New Moon conjunct Sun in Aquarius. The special quality of this New Moon is that the Sun is "in detriment" - that is, limited and weakened in his usual exercise of power - in Aquarius, so that the emphasis of the time tends to be upon the lunar and traditionally feminine areas of hearth and home, and the protection of children from winter illnesses, especially as it is close to Imbolc, the time of the mid-Winter season, when homes are cleaned and purified before the coming of Spring. Powers of perception and observation are heightened at the Aquarius New Moon, manifesting under the right conditions as a wealth of ideas and ambitious plans, especially as they may involve collaboration with like-minded friends. In the Celtic/Druidic and Wiccan Calendars, this February New Moon is Hunger Moon, as nature is frozen now in "Great Winter." In the Beth-Luis-Nion Celtic tree calendar used by devotees of the faerie path, this second New Moon following the Winter Solstice begins Luis, or Rowan month. The Rowan tree is considered especially efficacious for protection, healing and divination. Curiously, a lunar New Year festival period of roughly three days, beginning at the Aquarius New Moon, was celebrated in ancient Europe for many centuries before Julius Caesar fixed the start of the New Year at Jan. 1 on a 12-month solar calendar that was the basis of the 16th-century Gregorian calendar, now the standard for time reckoning in Europe, the Americas and other lands colonized by European explorers. The implications of this -- that all the peoples of Eurasia once lived by a single lunar calendar, but were split from each other when the new solar calendar divided West from East, solar from lunar, intellect from intuition, masculine from feminine, etc. -- is at the root of the cultural rift that has separated orient and occident ever since. In ancient Eurasia, peoples everywhere celebrated this festival as one of the three great turning points in the cycle of the Triple Goddess, the moment when the aged Wise Woman transmutes back into the Virgin who carries new life. Patriarchal religions have since taken over the show, but whether they can long continue to produce it remains to be seen, as the new Aquarian Age favors neither male nor female, but a complementary balance of the two. Gong Hay Fat Choy! The Year of the Fire Dog begins. In the Chinese lunar calendar, this is Hsih Nien, New Year's Day, and begins a two-week festival culminating at the Full Moon. The Chinese lunar year, basis of several other Asian lunar calendars, begins on the evening of the first New Moon while the Sun is in what the west calls Aquarius. This new Year of the Dog follows a Rooster year, and will likely favor loyal, patient devotion to principles at a time when they will be tested. Creative fire could not be coming at a better time. In the Vietnamese lunar calendar, which is synchronous with this year's Chinese calendar, this is Tet Nguyen Dan, first day of the New Year. 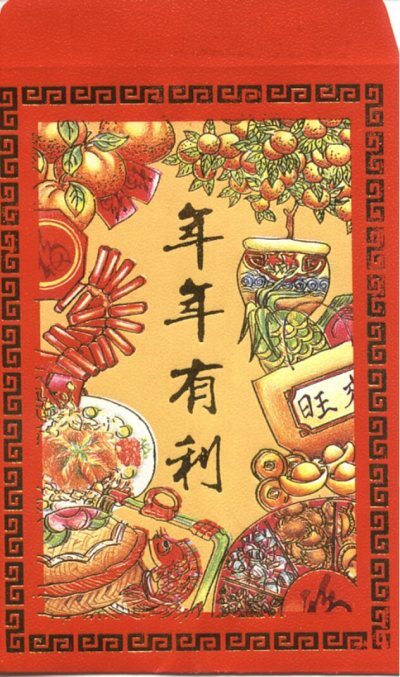 The observation of this lunar festival (which occurs on the second new moon following the winter solstice) begins two weeks ahead of time (during the waning moon) as people pay debts, clean homes, return borrowed items, and make offerings to the household gods. Children are given little red envelopes containing money. Tangerines are also gifts of good luck. Firecrackers and lion dances scare off evil spirits. People give each other special flowers called "hall flowers" because they have been reared in artificial heat (like forced narcissi): peonies, plum, peach and kumpquat blossoms and jasmine. In earlier times, shallot, onion and madder plants were sprouted by the same method. People also put up lucky talismans—lucky words cut out in red paper, sometimes more than a foot long, which are pasted up on the front of gates. Pictures of the Eight Immortals are also cut out and hung up in front of divinities. (These are very much like the paper cuts that appear on Days of the Dead in Mexico and at Shavuot in Jewish synagogues). Another New Year's custom is the Money Tree: pine and cypress branches placed in a vase, and decorated with old coins and paper pomegranates and flowers. Old coins (with holes in them) are strung on colored threads in the shape of dragon and put at the foot of children's beds. This is called "cash to pass the year." It is supposed to be saved and not spent. However, money is given as a gift, usually in red envelopes. New Year's Day is sometimes called The Day of Beginning or the Day of Three Beginnings (of the year, of the season and of the month). On New Year's Day, the aristocrats and officials of the Palace received purses from the Emperor embroidered with the eight treasures: the Wheel of the Law, Conch-shell, Umbrella, Canopy, Lotus, Jar, Fish and the Mystic Knot. The meal is the most important part of the ceremonies, as each dish has symbolic significance. All the food is prepared ahead of time, as no frying or baking are permitted on the holiday. Knives and cutting instruments are put away as well. No one sweeps since that would sweep away good fortune. The traditional main dish was a whole roasted pig, and at least one pork dish is still traditional. Chicken equals prosperity, a whole fish signifying the beginning and the end of the cycle is served but never eaten to symbolize plenty. Saifun (bean threads) represent long life and tangerines, piled high in a pyramid, are good luck and happiness. Expensive food items like sharks' fin, bird's nest and sea cucumbers set a tone of luxury. Clams are served to indicate receptivity to good fortune; vegetables are carved into the shape of coins. Dumplings are popular: sometimes filled with meat and vegetables--and sometimes just vegetables as many families observe the practice of not eating meat on New Year's Day. Deep fried to a golden color they are said to resemble bars of gold. Sometimes they contain a coin or other token inside the dumplings to bring good luck to the recipient. In ancient China, the festival lasted two weeks, until the Festival of the Lanterns on the full moon. Today the festivities go on for three days. 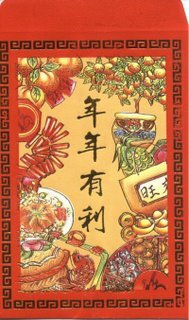 According to the writings of a sage from the fourth or fifth century, the ten days beginning with Chinese New Year are named after animals and plants. The first day is Fowl Day. The following days honor the Dog, the Pig, the Sheep, Cattle, Humans and Grains. Very much as the Twelve Days of Christmas predict weather for the coming year in British folklore, the weather on the these days predicts the coming year for each of these creatures. Bright clear days indicate prosperity while dark days warn of trouble.